We’re talking about his falling-off-the-bone baby back pork ribs slathered in Big Ben’s BBQ sauce! We’re talking about his shredded chicken, shredded pork and of course, his Big Ben’s BBQ Sauce!!! You can now enjoy Big Ben’s baby back pork ribs, shredded chicken and shredded pork at home. Just heat and serve! And it’s perfect for holiday entertaining, not to mention tailgating on game day! You can order online or in select locations in and around Pittsburgh! And if you’re looking for gifts for friends or co-workers? Big Ben’s BBQ Sauce comes in Mild, Hot and Honey Mustard flavors. You can also try his Hot Sauce and Spicy Wing Sauce. Big Ben’s BBQ Sauce introduces it’s Holiday Special – Big Ben’s BBQ Cooler (photo)! As a special promotion, be our 100th emailer and you will receive a complimentary Big Ben’s BBQ Cooler to get your holiday started off right! A winner will be announced later this evening! *A portion of the proceeds are donated to The Ronald McDonald House of Pittsburgh. 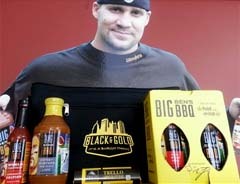 For more on Big Ben’s BBQ Sauce, Ribs, Chicken & Pork products, check out his website here. Fans: You can get website updates on both Facebook and Twitter! Join the conversation! UPDATE! We have a winner!!! Congratulations to New York City Steelers fan Jonathan Ortiz! He was our 100th emailer! Thank you to everyone who entered the contest!